FEBRUARY 10, 2017: The state’s Group Insurance Commission is scheduled to meet on Tuesday, February 14th to finalize plan design and rates for FY17, which begins July 1. Together with a coalition of active employee unions, our Association has called upon Governor Charlie Baker and the GIC to reconsider its plan to increase out-of-pocket costs. Baker, like past governors, controls all appointments to the Commission. 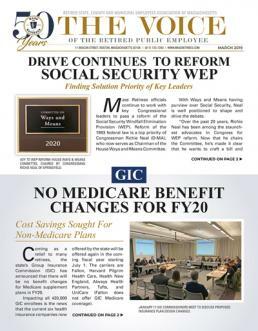 July 2015 Voice: As of January 1, 2016 retirees enrolled in the state Group Insurance Commission’s (GIC) Optional Medicare Extension (OME) plan will receive their prescription drug benefits through a federal Medicare program known as EGWP. The acronym, pronounced “Egg-Whip”, stands for Employer Group Waiver Program. Essentially, EGWP is a prescription drug program run by the federal government through Medicare Part D.